Two people from Italy (Stefano & Elenora) have gone together and created a strange and interesting thing for your ears. Stefano is a groundbreaker in using sounds to tell stories, he has a degree in Multimedia Art and works as an audiovisual artist in several fields of communication. He takes care of cello, prepared guitars, objects, mics and electronic devices. I think that Elenora is delivering the vocals on the album (and among other things)... Maybee it is her on the cover, quite a mysterious eyecatcher of a photo. The two are also being accompanied by Emanuele Magni, who does her share of Buchla music ease and other electronic devices. 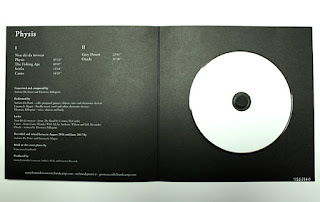 This CD album was released on the 8th of November via Manyfeetunder/Concrete and Grotto records, limited to 160 copies. And is also available as a digital version. More releases by Stefano are available on Bandcamp, while other physical releases can be headhunted on Discogs (some of them are not on the Bandcamp site). We´re in the fields of mysterious and highly evocative drone music, using real recordings as sound sources.Accompanied by seriously excellent and beautiful folksy and shamanistic female vocals. The sound quality is exquisite and authentic, but not losing that mysterious edge to it! Raw and mysterious ear/head sound-candy, a real gem of pure ritual glitchness!. For fans of Nurse With Wound, Zoviet France and Hybryds!